When I said adventure, you may be forgiven for thinking I climbed Mount Kinabalu, one of the highest peaks in South East Asia. Well, I didn't. I visited the foothills of Mount Kinabalu instead. It was an adventure of a different kind. 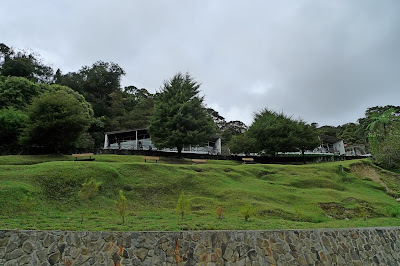 You see, on my second day in KK, I had planned to wake up early so that I could go visit Kinabalu Park. I woke up at 7am, which I considered very early for a night owl like me! What to do? 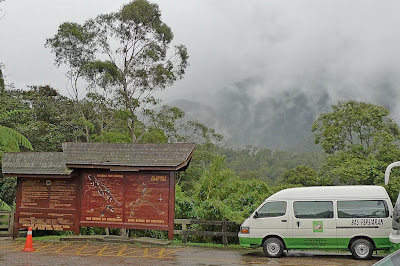 The chartered van that I booked the night before would be arriving at 8am to pick me up, so either I wake up early or I take the bus to Kinabalu Park myself! Coming out of my room which has no window, by the way, I was surprised that it was very bright! Oh my God, was I late? It looked like it was already 10am! I took a closer look at my watch. No, my watch showed 7.05am. Then it dawned on me for the very first time I set my foot in KK. The morning sun over here rises very much earlier than back home in KL. If you can imagine how 10am looks like in KL, then 7am in KK is like 10am in KL! Anyway, after having my free breakfast of toasted bread with margarine and kaya with a cup of hot coffee, I was all set for my Kinabalu trip. The van arrived right on the dot at 8am. After picking up 3 other tourists at different hotels, we were off on our way. The journey took about 1 and a half hours. It was halfway that my problem started. I suddenly felt a little pain on the left side of my abdomen. I felt the urge to go to the toilet. That was strange as I already did my business early that morning before my breakfast. I was thinking, please, not now! The pain came and went a few times. But I managed to bear with it. After some time, my urge to defecate was no longer there, so I forgot about it. Ascending the mountain in the van, I was fortunate to be sitting on the left side. That's because I noticed the beautiful view of the mountain and the countryside was more likely to be seen out the left window. 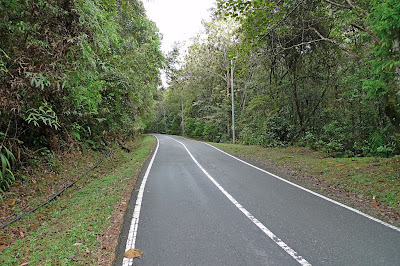 So, next time you are traveling up the Kinabalu mountain in a car or bus or a van like me, try to sit on the left side. The downside is you get more of the hot sun blazing down on you! 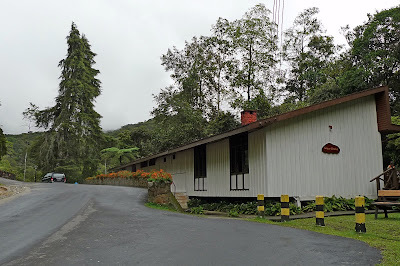 We reached the Kinabalu Park Headquarters at around 9.50am. I paid RM3 at the entrance gate. The van dropped us all off on the main road. By the way, the cost of the chartered van was RM16. Quite reasonable, I think. Here's my RM3 ticket entrance. Very clever of them to call it conservation fee instead of entrance fee! Makes the 'environment friendly' spirit in me more willing to pay. Haha! 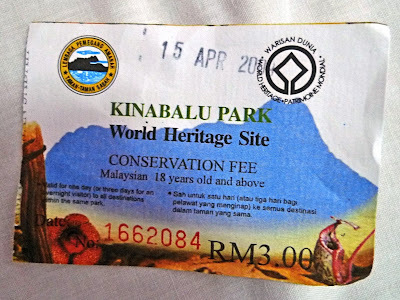 By the way, are you aware that Kinabalu Park is Malaysia's first UNESCO World Heritage site? It is even stated a World Heritage Site on the ticket itself. 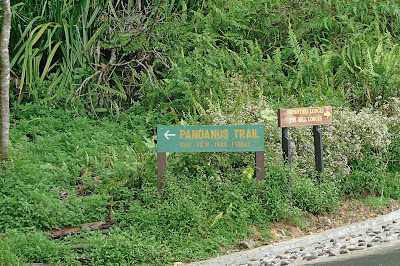 It seems that Kinabalu Park is one of the world's most important biological sites. It contains high biodiversity with representatives from more than half the families of all flowering plants. And the majority of Borneo's mammals, birds, amphibians and invertebrates are found here! And do you know the size of Kinabalu Park? It covers an astonishing area of 754 square km which is bigger than our neighbouring country, Singapore! This is the main road where we were dropped off. This photo was taken when I was about to go back. Forgot to take photos when I arrived there! Anyway, did you see the mists? It covered the mountains which were hardly visible. The weather was cooling, not as cold as Genting Highlands, but cooler than KK town of course. How I hope the weather back home in KL is always like this! I did not know where the other 3 tourists went, but I was off on my own. Walking along the quiet road side, I was enjoying the greeneries all around me. There were not many people around. I guess most people who come here aim to climb the mountain and not walk around the park. After walking along the road pictured above for some time, I reached a quaint looking building. 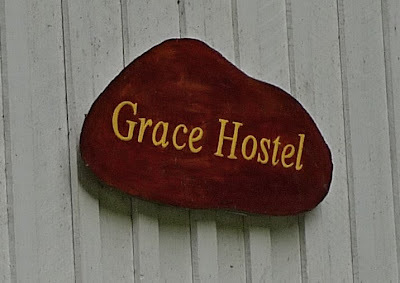 It appeared to be a hostel by the name Grace Hostel. Look at the row of flowers beside the hostel. Nice? There was another hostel a few metres below beside this one. It's called Rock Hostel, if I am not mistaken. I really don't mind staying here for a night just to enjoy the cool mountain air! Passing by this rather picturesque road, I looked up to my left and saw more lodgings on top of the hill. Probably the higher end accommodation since it's on higher ground! After passing these lodgings, a further walk up the road brought me to these signboards. I must admit I did not do proper research before embarking on this trip so I was not very familiar with the places that I should visit. In fact, I did not know where will all this walking lead me to! I hoped to walk some of the many jungle trails like the Pandanus Trail in the photo above, but I wanted to see what was ahead of me so I decided against it. Walking along further up, I reached the Liwagu Suites and Restaurant. I knew from my rather sketchy research that there was a Botanical Garden near the Liwagu Restaurant. But I did not know the building in front of me was the Liwagu Suites at that time as I did not see any sign board. I only saw this. Wow! Can you believe it? These superhumans could climb up and down Mount Kinabalu in record breaking 3 hours! In fact, in the men open category, the champion did it in an incredible 2 hours and 44 minutes! Whereas us mere mortals would need to accomplish such feat in 2 exhausting days! 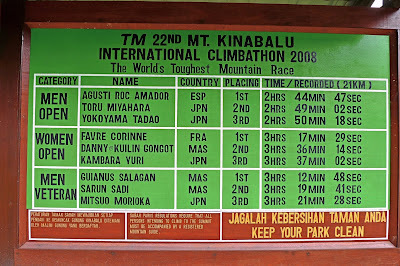 Game for the upcoming 23rd Mount Kinabalu International Climbathon on 24th October 2009? Register yourself here. Passing these signboards, I continued to walk up the road. And that's where my pain started again. The pain in my abdomen. I had the urge to pass motion. Should I turn back or continue to walk up the road? I decided to continue walking. 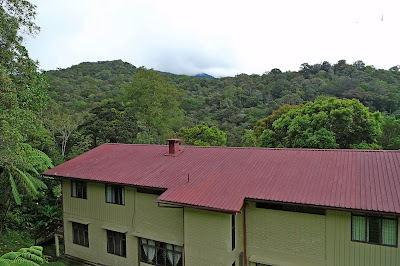 I was hoping that maybe somewhere further up, I would find another lodging or hostel where I could just drop by to make use of their washroom. But it was not to be. I walked for more than 20 minutes and the road ahead looked like this. It was an endless stretch of road and I really did not know how far I got to continue walking! The road was getting steeper too. Somehow, I knew I got to turn back. Meantime, my stomach pain increased, and I had to stop walking for a while to ease myself of the pain. I really thought I must find a toilet somewhere! Just then, a backpacker passed by. He was from the opposite direction walking downhill towards me. He said, "Hey, where are you going?" I told him I was trying to find the Botanical Gardens. "Oh! You have passed it!" he said. "If you continue walking in this direction, you'll reach the Timpohon Gates! That's about 3km from here and the road is awfully steep." Timpohon Gates is one of the starting points for climbers of Mount Kinabalu. I could not thank him enough for pointing me out. So I walked with him down the road but my pain in my stomach had not subsided. I needed to get back to the building I passed by earlier (which was the Liwagu Suites) to use the toilet! But I really did not know if I could make it in time. I told the backpacker guy my predicament. He said, well, I better hurry along or else I may have to do it inside the forest! I didn't like that idea one bit! So I said bye to him and raced down the road. Somehow I got to reach the Liwagu Suites. I know, I know! When your poo is about to come out, you can't run, can you? It'll make them come out even faster! But I had no choice! Either they come out now or they come out now! I really did not know how I did it. But when I saw the building in front of me, I just raced like mad. Raced down a series of steps, I entered the building and searched for the washroom. Luckily, I saw it. Went in and did my business! Phew!! What a close call! If I were to join the Amazing Race at that moment, I am extremely positive I will win the race! I never got to meet up with that backpacker guy again. I did not even know his name! Which was a pity as he was a rather pleasant fellow. Well, backpacker guy, if you happen to read this blog, please email me! I would like to be your friend! 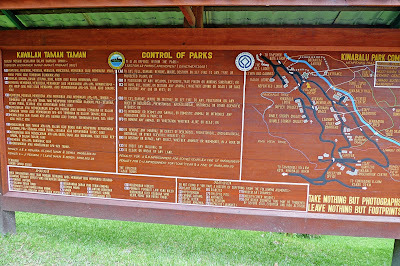 For the benefit of my readers, here is the map of the Kinabalu Park taken from Kinabalu Blog. 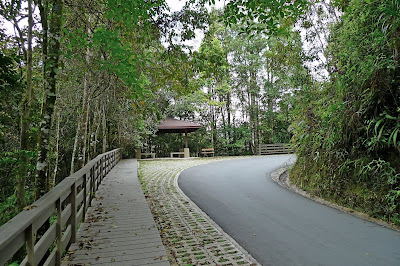 What did I do next at Kinabalu Park? Well, that will come up in my next post, so stay tuned! lol haha.. i didnt expect that..
Congratulations on your first adventure! Crap happens sometimes but what's more important is that you get to do what you have to do. I'll head now to your next adventure. Lovely photos. Txs for dropping by. I've added your lovely blog into my blogroll and looking eagerly for your next posting! I salute you la. So how was the toilet?!! Aiyo luckily you can 'tahan'. I wonder whether you dare to have breakfast at the lodge the next day. kenwooi, congrats! You are FC today! You mean your friend saw ghosts? Well, that's not surprising as the word Kinabalu comes from the term Aki Nabalu meaning revered place of the dead! eiling, well it was not as clean as the ones in Lavender Lodge where I stayed! Miraculously, I managed to place some tissues on top of the toilet seat even as I struggled to prevent my poo from coming out! LOL! che-cheh, I really do not know if I should blame the breakfast food I had in Lavender Lodge. I mean, I'm pretty sure the food were clean and hygenic. I took the slices of bread out from the packet myself - it was not already placed on a plate. And the margarine and kaya were all in containers that were closed. The park look nice. Waiting for the next episode of the Kinabalu Park. Lucky you make it to the toilet just in time. I can imagine how cool and fresh the air must be. Looking forward to reading your experiences there. Btw, Conservation fee is a smart idea and the ticket stub is truly one for the collection. Thanks for sharing it here, Foong. I wouldn't have known how it looks like otherwise. i like to backpack, but will never do that alone, is VERY VERY DANGEROUS and lonely. But looks like you enjoyed very much, good! i been there in the park. i can follow yr post. abt the poo thingy i oso been there hahahahaahah. Wow, interesting journey. I would want to do both the climbing and roaming the park if I were there now. Your stomach pain, could it have been from the food? Just a guess. 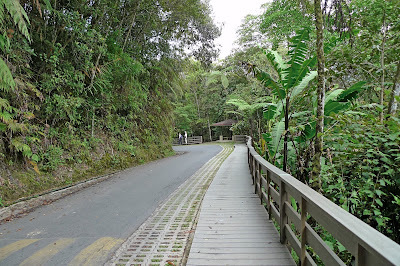 I had been to the foothill of Mt Kinabalu too a few years back, but didn't spend much time in the Kinabalu Park. My memory is scarce now but I remember I did go to the hot springs! I've been to the foothills many times...nice, beautiful, cool...but I never tried to climb to the top. No way! I'm so fat! molly, I guess backpacking alone may not be so suitable for ladies. But there are ladies who are brave enough to do it! bengbeng, what? You also had the same "poo" experience like me in Kinabalu Park?! JL, yes I suspect it's from the food I ate for breakfast, but not because it was dirty or unhygienic. It's the wrong combination for me. I ate bananas followed by bread with margarine and kaya. I think the combination of banana and oily margarine is bad for me. I remember my stomach could not tolerate fruits and oily stuffs. Wow~~!! I wanna go there!! Looks like some foreign country place. it must be an unforgettable adventure for you Foong. KK is home to some amazingly lovely views and lush greenery. i'm gonna make plans for my next getaway. Wow interesting! Looks like staying at Mt. Kinabalu would be fun. i wished I could climb Mt. Kinabalu... I will need to keep fit first.. doubt fat me now can make it :P.
Don't cha hate those moments when you need the toilet and can't get one? lol. Glad you made it to yours, else the bugs be either enjoying your poo or cursing at you for ruining their home :P.
Oh so, besides that backpacker there were others around? I thought the place was so deserted there were only the two of you. 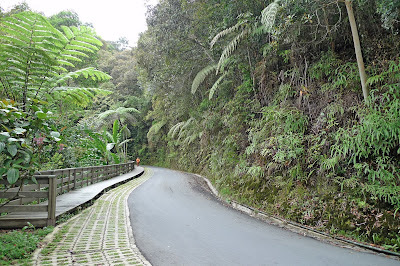 Being alone in the jungle albeit a national park with properly paved roads is kinda scary. No? Oops! My imagination getting the better of me. You didn't or haven't spoken a word about mozzies. Was there none? happysurfer, yes of course there were other people around, but not many. Just a few here and there. There were more people at the Liwagu Suites though. I don't feel it's scary, maybe because I just love the cool environment there - so relaxing. Maybe it'll be different at night! Haha! if you're reading this, i don't know y my comments can't appear in your blog for some reason. i'm using Yahoo ID. life ramblings, I have no problem leaving comments at JL's blog. bengbeng, I'm sure you have lots of experiences in your younger days. You talk as if you are very old! haha! Hi Life. I'm so sorry about that. Try logging in using your blogger address? Select the "log in using OpenID" and enter your Blogger URL to comment. I found that to be the simplest method of commenting and it's what I used to comment at Mariuca and Monica's blog before I myself switched. Obviously missed the chop ha ha! So where to next Foong? JL, no problem. You have sixth sense or something? LOL!